The Coombs Creek Trail begins as a soft path from the flood protection levee under Beckley. The paved portion begins near Junior Drive. When it opened in 2009, the Coombs Creek Trail followed a 1.5-mile path along Kessler Parkway to Stevens Park Golf Course. The trail recently was extended to Colorado, where it makes a left on Plymouth and goes all the way to Hampton. 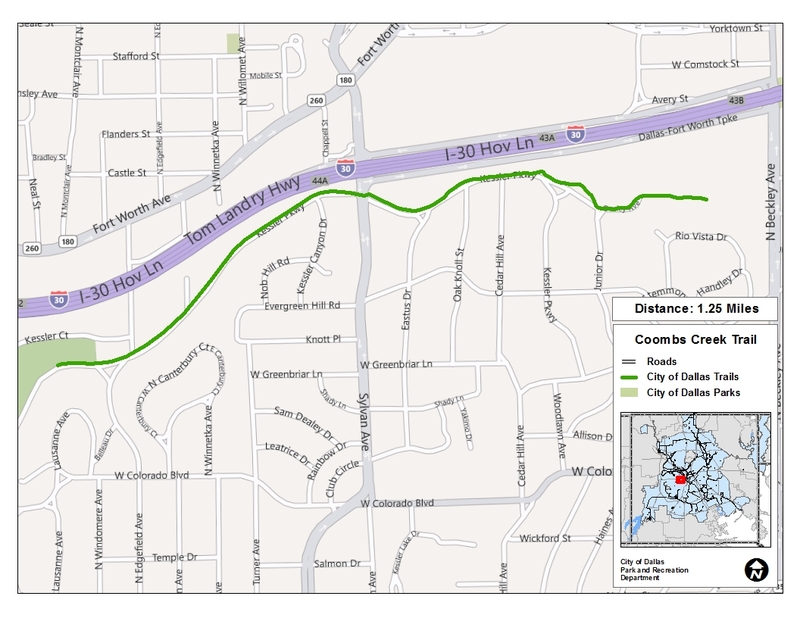 There is a very preliminary plan to connect it eventually to the Chalk Hill Trail in West Dallas. On the Kessler Park end, the trail will connect at Sylvan Avenue to the new Interstate 30 bridge, which is expected to open next year. From there it will meet the Trinity Skyline Trail, a major connector in The Loop. Unfortunately, the plan did not include a crosswalk for people to cross from one side of Colorado to the park’s renovated pavilion next to the golf course. So if you are wheeling, either yourself or a toddler, it is difficult to get to the park. Also, I’ve noticed the park is not used as much as it had been in the past, due to the parking lot’s removal. Change is good, but poor design is not.